As in the past, I really didn’t know what to expect coming into playoffs on Saturday. Malys had limped into playoffs and got beat by the first place team two times during the regular season in dominating fashion. Marketlab had a solid season finishing 8-2, with the top teams in the division giving them the hardest time. Lastly, the Stick Heads made playoffs because another team dropped out. Beating Grand Valley was an almost impossible thought. We have had a lot of success vrs Main Street and this game would be no exception. We notched the first 3 goals in the game to take a big lead. I really can’t remember the first goal they scored off hand, but we scored to make it 4-1 shortly after that. They scored their 2nd goal off a rebound I gave up in the last few minutes, but by then the game was over by a final of 4-2 and we had an almost impossible game coming up against the Rabid Wombats. The Wombats came into this game with the best record and the best team. They beat us 7-2 and 7-4 respectively during the regular season. Everyone on our team had a bad feeling about this game. Yet, we came out and played an awesome game. We passed the puck and capitalized on the few chances we had. They took the early 1-0 lead though off of a shot that hit me and I thought it was under me, but it had in fact trickled behind me and sat there until one of them poked the puck in. Eli tied the game later in the first period to tie the game 1-1 at the end of the first. In the second period. Chad wristed a shot from the point that found the back of the net. With us up 2-1 at the end of the second period, we needed to keep up the hard work. We did so and we held on to win the game. How did I do? I came up with several strong saves in this game. A couple shots were labeled for the top part of the net that I stopped with my glove or blocker. Overall, the best game I have played so far. The Dragons came up with a upset over the Guns of Pablo. Marketlab just played a very solid game in order to keep the Dragons off the board. I came up with a few good stops, but my team really came up with a stellar performance. We moved out to a 4-0 lead by the 3rd period. Then, we sat on the lead the last 10 minutes giving the Dragons some offensive leeway which they took advantage of. I gave up a rebound and the put it back into me but it trickled behind me and into the net to give them a goal in the final 3 minutes. We still won 4-1 which put us in the finals against Red Army. If I won this game, I would have probably retired because it would have been the biggest upset I have ever been a part of. Instead, this game was a 7-1 loss where I played pretty well but just didn’t do well. We just got hammered but we had fun playing our last game together….at least for a while. We had beaten the Dragons in the regular season 5-1. I really didn’t know what to expect out of this game. The Dragons path had taken them through two games as well so it wasn’t like either of us had less games. That being said, it was a tight game from the start. I was beaten by the only goal I gave up by Brad, their best player. He rifled a shot top corner on me in the slot to give the Dragons a 1-0 lead. In the second period, we tallied two goals. Phil got a good sharp angle 5 hole goal to tie the game. Then, Nick came back from a 2 game suspension and scored off of a rebound attempt. He needed about 3 swipes to get it in. Through the entire game, the Dragons put a lot of shots on me. My defense cleared some rebounds, but they shot a lot right into my chest. The closest they came to tying it was a rising backhand in the slot that hit the post. I was not ready for that. With a minute left, Eli missed a wide open net with the goalie pulled. He was hooked by the defense, and I thought for a second that it might be a turning point, but it wasn’t. We held on for the win and our second championship in three sessions. That was my 25th championship. I have achieved my goal that I set for myself at the beginning of the year. I am indeed very fortunate. The games we have played so far have been very competitive ones. This one would live up to its billing. Brit would score first for us off a rebound chance to bring us up 1-0. Red Army answered off a partial breakaway. I let him drive around the top of the crease and backhand it into the wide open side of the net. At the end of the first period it was 1-1 and I knew I should have dove out to stop that player from driving around and my teammates told me. The second period was a coming out party for Red Army early. They notched a goal off a shot from the top of the faceoff circle. I didn’t see it because he used my defenseman as a screen. I didn’t see it until it was too late. Red Army continued to put pressure on me and they got another goal off a sharp angle rebound. I dove over to cover the puck and they banked it off my stick and it somehow trickled into the net. Down 3-1, I didn’t have a good feeling about this game all of a sudden but I didn’t let it shake my confidence. I continued to make stops to keep my team in the game. We scored later in the period off a nice 2 on 1 chance to bring us closer. The final at the end of the second period was 3-2. We came out much stronger in the third period. Brit got a nice goal that went five hole on the goalie to tie the game. I really can’t remember the 4th goal we scored, but we did so with 5 minutes left to go to take a 4-3 lead. I lept inside and I also pumped my fist at that point. I knew I could keep the lead. Of course, knowing you can keep the lead and actually keeping it is another thing. Less than a minute later, they had tied the game off a shot that deflected off of at least 2 people. With 4 minutes to go, the score was tied once again. Both sides exchanged shots but it was the last one that Marketlab had that was the difference. With 43 seconds left, Red Army had a defensive breakdown leaving Andy right in front of the net with the slot with the puck with only the goalie to beat. The goalie dove out to knock the puck away or cover it, but Andy deked around him and put it in the yawning cage. We had taken the lead 5-4, and this time we would hold it. I made one good butterfly stop and my defense did the rest to win the game. That would be my 26th championship. What am I the most proud of? I usually can remember a few big stops I had in the games I played. I came up with some, but none that I remember conclusively. The thing I am most proud of are the performances of my teams. Malys had a tough road to the championship but went through three teams that had done better than they had through the regular season. The defensive effort they put on in front of me was outstanding. Marketlab participated in the most competitive division and came out with a championship. They dropped their first two games of the season and then picked themselves up and played spectacular hockey the rest of the season. In the playoffs, they played their best hockey. Especially in the final game against a team that averaged 7 goals per game. What was the surprising story of the playoffs? 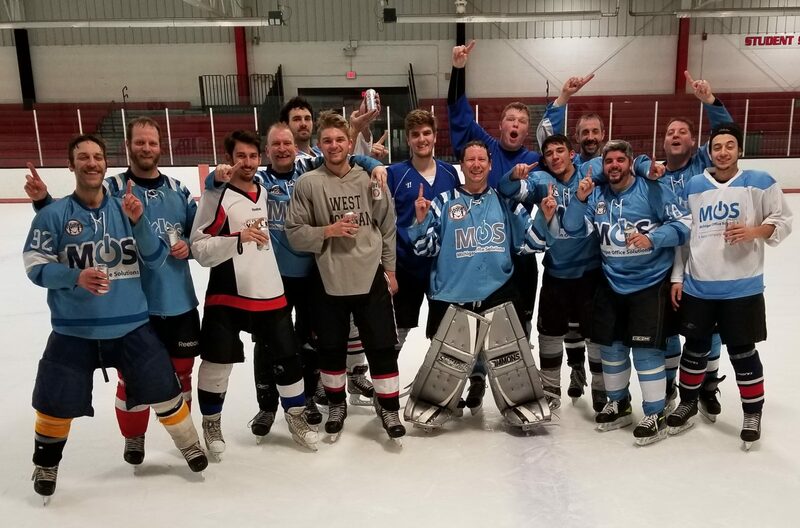 The Thursday hockey division was the most competitive division. Marketlab was locked into 2nd place needing a win to keep that 1st round bye and possibly a 1st place finish. They beat Red Army in OT to keep 2nd place but that was only because they took dumb penalties. We win that game outright it changes the playoff picture. We lose that game we are in 3rd place and not getting that bye in the first round. What about the other teams in the playoffs that I didn’t talk about? Ellis Sales won their game which put Structural Standards out of the playoff picture. They don’t win and I am playing for them in that 6th seed which may wear me out playing an additional game. The team that slipped into that 3rd seed beat us in the regular season, which was the Hot Shots. I call them “Jordie’s Team” and they would have tore through Structural. Ellis beat them in the first round which was a big playoff upset. One last thing about surprising stories. The top seeded team only won in 2 divisions, one of them was by a forfeit. That just shows how much parody there was in the playoffs and always will be. Just getting into the playoffs should be the goal for any team because anything can happen.